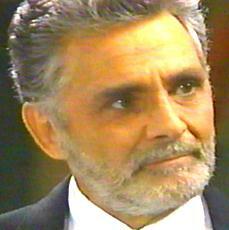 Portrayer: David Hedison, August 6, 1991 - January 16, 1995; April 13, 1995 - June 20, 1995; October 12, 1995 - December 20, 1995; February 26, 1996; April 15, 1996; March 23, 1999. Arrival: Came because his son Grant Harrison was shot. Departure: Left because his son Grant Harrison wanted him out of town to keep him quiet about Grant's affair with Lorna Devon. Introduction Scene: The hospital, to two reporters accosting him, "Just get yer hands off me, awright!" Exit Scene: (January 1995) Amanda's bedroom at the Harrison Mansion, to Amanda Cory, "I love you." Birthplace: Ireland (emigrated when he was 13). Other Aliases: Sean Harrison (former birth name). Johnny Ryan (current birth name). Spencer's father was named Patrick Harrison. Both his parents are presumed dead. Spencer has two sons, one natural and the other adopted. Grant Harrison. Grant has the always been the apple in Spencer's eye. Spencer concentrated all his efforts into molding his son and paving the way for his eventual career in politics. Spencer loves his son, but will too often go to extremes to protect Grant from situations that might endanger his career. In 1993, Spencer anonymously sent Grant death threats in hopes of dissuading him from marrying Vicky Hudson. When Grant found out what his father tried to do, he broke off all ties with him. During the next year, Spencer won his way back into Grant's life, and Grant often came to his father for help with a personal problem. In 1994 Spencer vehemently disagreed with Grant's actions toward his wife Amanda Cory. Spencer loved Amanda and felt she was the perfect wife for his son. He hated how Grant was mistreating her, and Grant, afraid that his father would spill the beans about his affair with Lorna Devon, arranged for his father to leave town. Spencer has returned three times since then, and father and son have mostly patched up their differences, although they still tend to disagree about many things. Ryan Harrison. Up until 1992, Ryan believed that Spencer Harrison was his father. Then, Spencer revealed that he was not Ryan's biological father. Ryan was never close to Spencer and this pushed them apart even more. Ryan began to call him by his first name, but Spencer still maintained strong paternal feelings for Ryan. Spencer has a brother, Frank Harrison, who has never been seen. Frank is the father of Kelsey Harrison. Kirkland Harrison, grandson. Kelsey Harrison, niece. Spencer maintained for years that he was deeply in love with Justine, who was said to have died shortly after giving birth to Ryan. In truth, Spencer turned against her when she had an affair with Carl Hutchins. He cast her out of his life, and forbade her to see her sons again. He made regular payments to her until he heard that she had died in 1985. In 1995 Spencer was stunned to come face-to-face with Justine in Bay City. Out for revenge, Justine gave Spencer decongestants when he asked for aspirin and the pills gave him a stroke. Justine taunted him mercilessly while he was in hospital. He was greatly relieved when Justine was killed several months later. Iris and Spencer became lovers soon after they met in 1991. They enjoyed a relationship for about a year, but neither was interested in a commitment. They broke up amicably in late 1992. All chance of a reconciliation was dashed in 1993 when Spencer began a hostile take-over of Cory Publishing. Since then, Iris and Spencer became enemies. Before she left town in fall 1994, Iris reminisced with Spencer and lamented that things had not worked out differently between them. In 1992, Spencer and Felicia went on a couple friendly dates. They had gotten close due to their shared problem with alcohol. In 1991, Rachel began a flirtation with Spencer. Their relationship never went very far. Seemingly tired of Rachel, Spencer began an affair with Iris Wheeler. Rachel and Spencer became enemies in 1993 when he formed a hostile takeover of her company, Cory Publishing. By the summer of 1994 they were apparently on friendly terms again, probably due to the engagement of their children. Spencer is an alcoholic, a periodic binger. He turned to Irish Whiskey after Justine left him. No one in his family knows of his drinking problem. in 1995 Spencer suffered a stroke after unknowingly taking decongestants. He was partly paralyzed and unable to speak for a couple months. By the end of the year he had made a full recovery. Spencer has committed various shady deals during his lifetime. Spencer is the head of a large never-seen company that keeps him wealthy and well-steeped in caviar. In 1993, Spencer formed the Harrison Foundation, a front company for Distant Sun which was forming a hostile takeover of Cory Publishing. His plan succeeded, and his front man, Jake McKinnon, became CEO of Cory Publishing. In early 1994, the Cory family was able to win back their company. In spring 1994, Spencer built the Harbor Club, which he ran as a legitimate business.